A mini-update to the bedroom makeover. 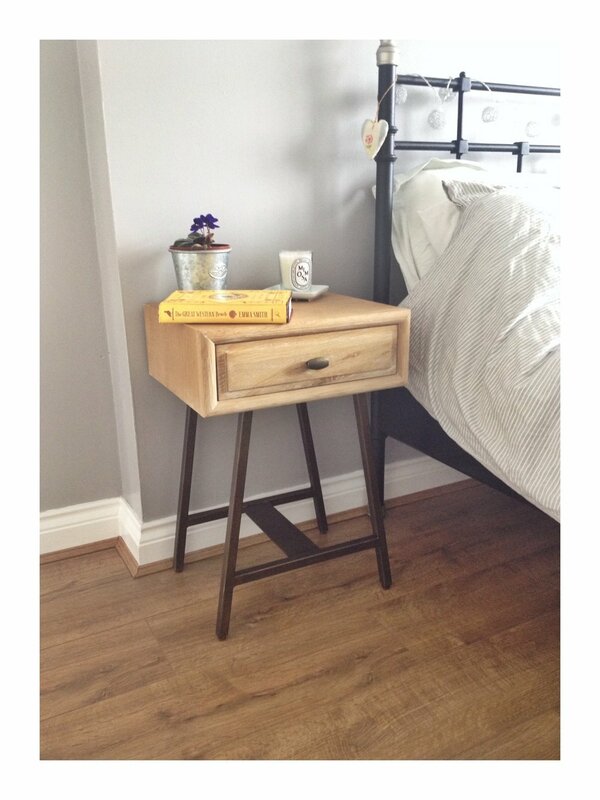 The bedside table I have coveted since the second I flicked the page in the Loaf catalogue has arrived. It’s the simply beautiful Campaign Bedside Table. Inspired by a 1940s sideboard the Loafers saw in a Parisian market. It looks good, when you stroke it – it feels good and it smells deliciously woody. The table is made from weathered oak, it’s quite dinky measuring W 42cm D 35cm and H 60cm so it’s ideal for squeezing into a small bedroom. It has a handy little draw – perfect for keeping all manner of secret little things. The legs are brass with a vintage feel. I’ve helped it to settle in by giving it a little purple flowering plant in a galvanised steel pot from IKEA and a Diptyque mimosa candle to chat with and it’s casually holding my book The Great Western Beach by Emma Smith – a lovely little memoir of growing up in Cornwall between the two world wars. My search for quirky accessories and a vintage mirror continue. For more easy makeover tips – come back soon.